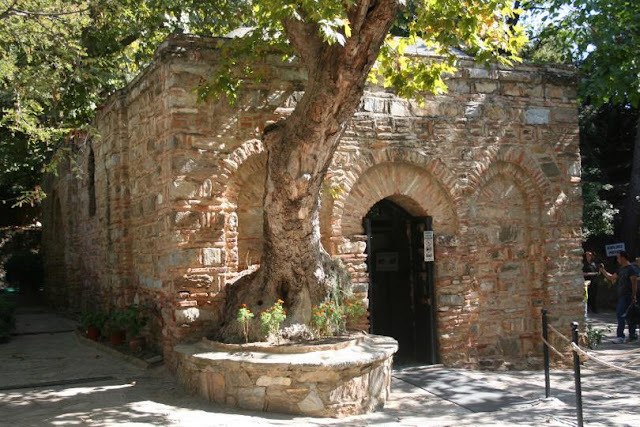 Image: The supposed "house of Mary" near the site of ancient Ephesus in Turkey. Tradition says John brought Mary to Ephesus and cared for her there. I preached this morning a sermon on John 19:23-27, including our Lord’s words from the cross to the beloved disciple, “Behold thy mother!” (v. 27a), entrusting care of his mother to this disciple (John). I ran out of time, so I did not get the chance to share this intriguing insight from Calvin on v. 27b: “And from that hour that disciple took her unto his own home [eis ta idia]” (v. 27b). Notice “home” is in italic. Again, we see Calvin’s commentary influenced by his contemporary efforts to reform the RC church of his day. His point: You don’t have to take a vow of poverty, renounce the world, and live in a monastery to live a faithful Christian life. This is not what the apostles did. On the contrary, your duty is to live in the world while not being part of it, and to love Christ and love the brethren.